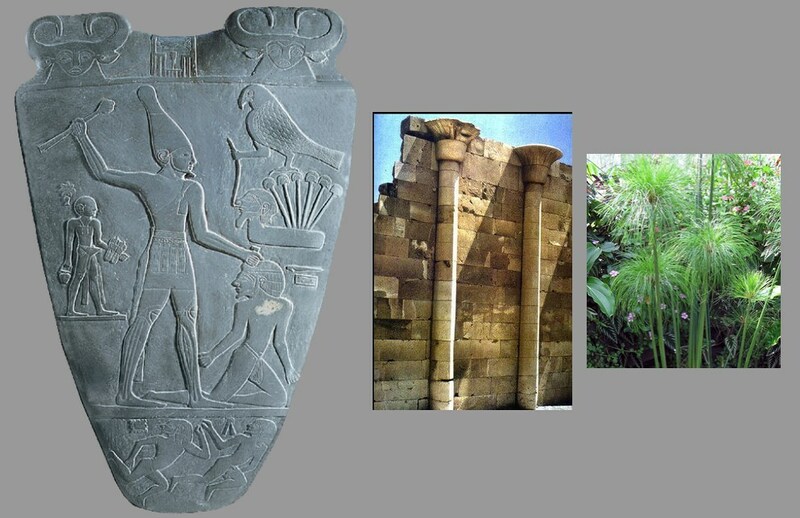 The evolution of the building of pyramids is a significant discussion in terms of Egyptian art. They are the most obvious artifacts and the most visible. In this next section were going to focus on how the pyramid shape evolved and how it was used by the Egyptians to support their political and religious life. The most important thing as the basis for us to understand Egyptian architecture is that we only really have architecture from cemeteries. Most of the architecture that survives is either temple architecture or tomb architecture. Many of the private houses and dwellings were made out of either mud brick or reeds and other types of mud brick. The architectural forms that were can be looking at are actually less symbolic and iconographic of specific symbols than they are just natural forms that evolved out of the materials with which they were made. There’s a lot of discussion about the magic of pyramids and how they were built. I know some of you must’ve watched ancient aliens all of that stuff is nonsense. The shape of her tomb or a pyramid does not have magical power they’ve tested it and found out that there are no energies or anything like that extra inside. In fact, probably even people from ancient Egypt would’ve thought that was ridiculous. The other misunderstanding all of us have about pyramids is that the insides were decorated with wall paintings. A lot of tombs do have wall paintings in them like King Tut’s tomb but the pyramids do not. Some of them did have booby-traps but they didn’t work at all to keep out the tomb robbers. All of the tombs have curses on them but every single tomb has curses on them you try to rob them. Apparently they don’t work very well. The main ideas behind studying Egyptian architecture are that the ones that we are studying are based in religious uses and mainly in service of the dead. Egyptian tombs and pyramids began as short bench like structures that are called the mastabas, which is Arabic for bench. These tombs were used to contain effigies of the dead person and usually had a small temple associated with it in which people can leave offerings for the dead. 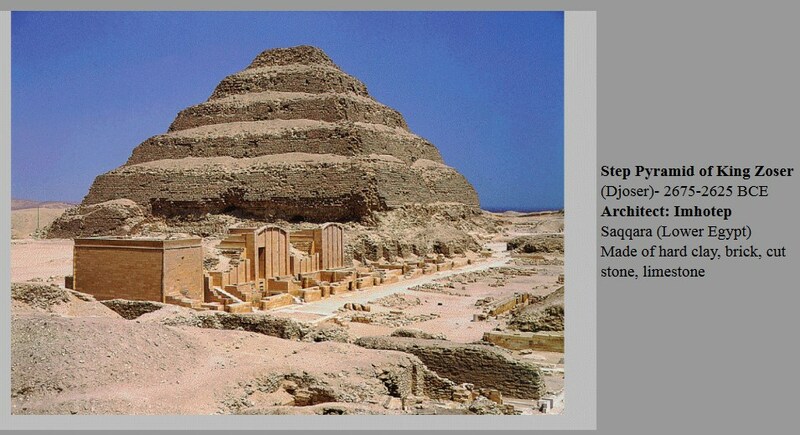 The main reason for making a small temple or tomb like this with stone shafts is because Egypt is almost all sand. Therefore anybody that was buried in the sand would be easily unearthed and the animals would get at it. In fact Egypt had a lot of jackals and jackals frequented cemeteries and therefore jackals are associated with the God of the dead Anubis. So the first tombs were basically stone boxes that were meant to preserve the body of the dead person. We don’t have any mummies from when the pyramids were built. In fact, the pyramids NEVER actually have the real bodies of the royal deceased; they were buried in another secret place. There are very few inscriptions on a lot of the pyramids and so we also have a hard time really identifying especially the smaller tombs since they were already looted with anything with the inhabitants name on it. The notable exception to this is King Tut. The first pyramid were going to look at is the pyramid of King Zoser, you’ll find this spelled in a variety of ways. 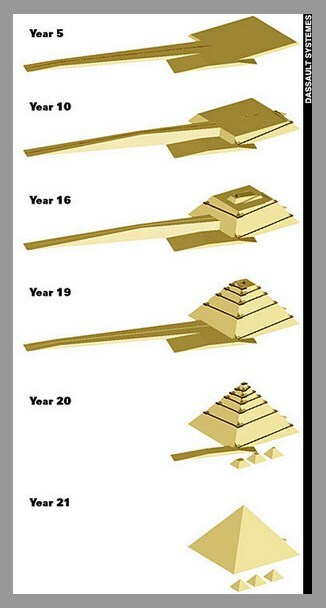 The pyramid is really just a step pyramid and will return to that in a minute. Was probably as important as the pyramid are the series of buildings surrounding it. The Egyptians started putting their tombs on the west side of the Nile and they would actually call dead people people from the West. This is probably because that’s where the sun sets. The tombs and the first step pyramids were constructed in grave sites were graveyards already. Since these tombs were to be the houses of people who would go on living in a supernatural sense, they needed to be complete in some ways with everything that the spirit would need to feel as if it was alive. So the Egyptians decided to create a sort of city of the dead in which all of the buildings are fake or simulations of buildings. 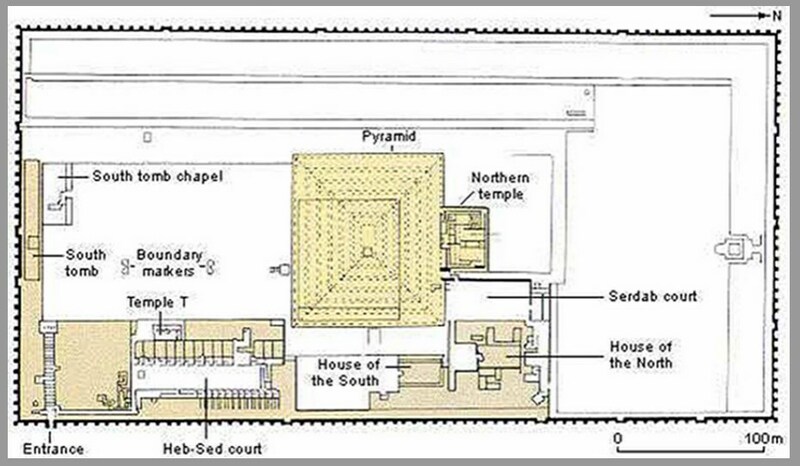 The buildings that you see in front of the pyramid are filled in non-usable solid structures that represent the kinds of temples and buildings that one would need in order to continue to rule in the afterlife. There’s even a court where the King is supposed to prove his worthiness and receive competitors to the throne. It’s called a Heb Set Court. The pyramid that was constructed on top of where the King’s tomb shaft would be began first as a small flat bench like building. After a while, the Kings architect Amenhotep decided to expand the structure and make it more magnificent. 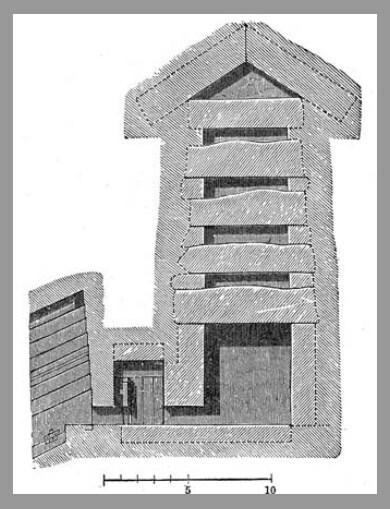 This diagram above describes the expansion of the tomb. The main idea here is that it’s basically just a big monument that was created with the wealth of the King as a capstone grave shaft. 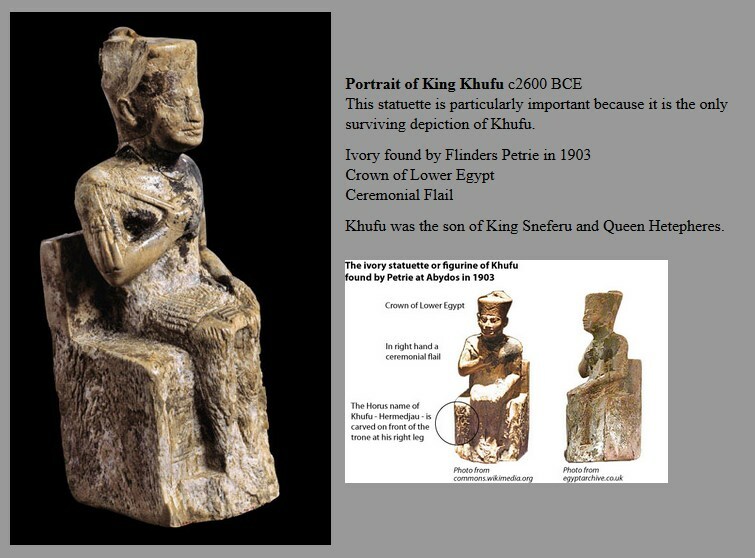 There’s another King who comes along and decides that once his grave to be above ground inside the pyramid itself and that’s where we get the next evolution of three pyramids that were designed or at least funded by King named Snefru. Rather than discuss each pyramid separately, I want you to think of them as a continuum. 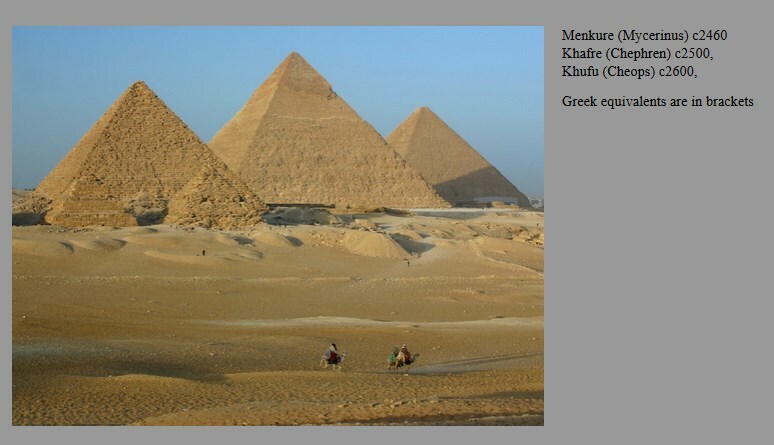 Some of the evidence that all three of these pyramids are attributed to King Snefru is open to debate however major Egyptologists agree that he probably is responsible for these three pyramids. 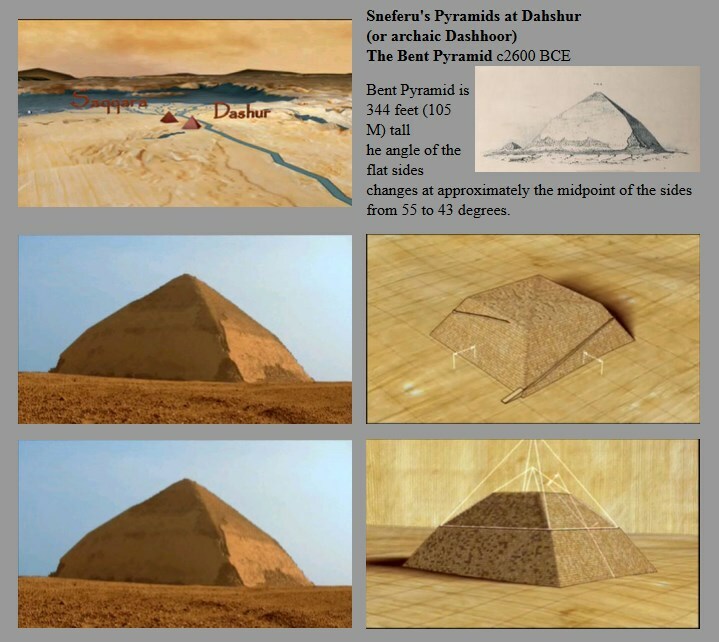 Perhaps the most significant thing about these pyramids are that they attempt to put the tomb within the body of the structure of the pyramid and there have been attempts to make them 45° pyramids so that they are exact triangles. This is probably been attained by filling in sections of the pyramid we can see that this was achieved but in exactly in the first instance of this pyramid. 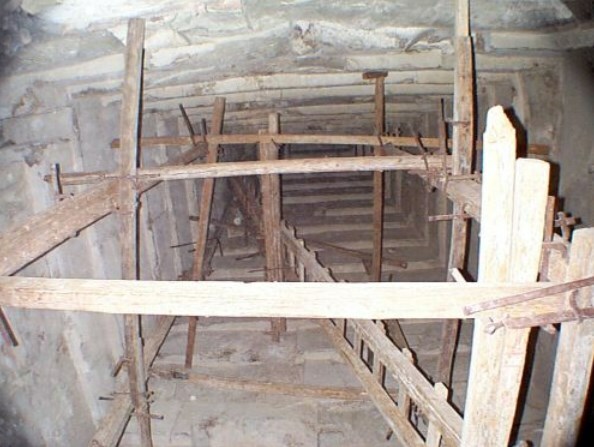 Part of the design of the so-called red pyramid which is the first pyramid Snefru start to build is that there is a chamber in the interior. The chamber is basically what we call a corbels archway. It’s a kind of upside down stairway design in which the weight of the bricks is stacked on top of one another so that they come together in a type of the shape at the apex the ceiling. The red pyramid seems to be the only success of the bunch. 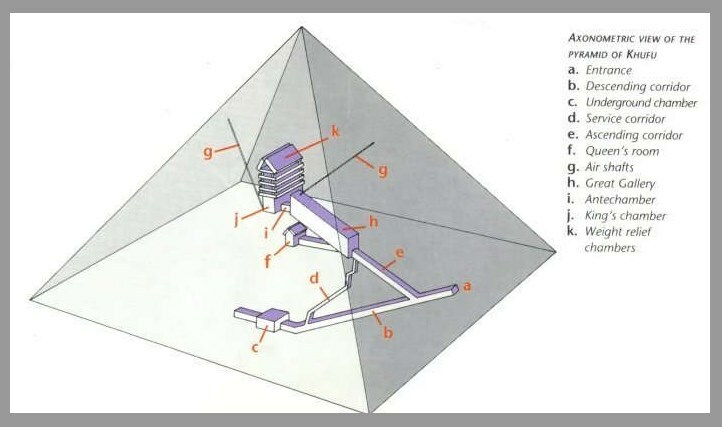 The reason why this is important to Egyptian engineering is that they were able to figure out how to create a series of chambers with in the interior of the pyramid that relieve the stress enough on internal central chamber to make a tomb. In essence it is the prototype of all the other great pyramids that we know about. 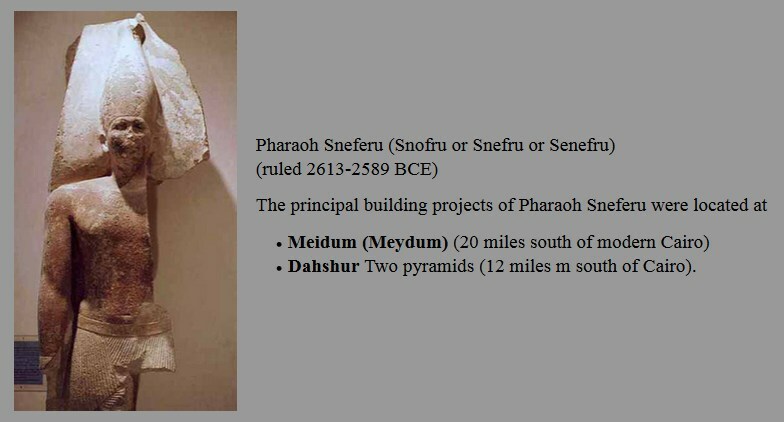 The so-called bent pyramid by Snefru has many of the same features as the first failure. Inside the structure are a series of timbers that are attempting to brace the interior chambers that are in the center or heart of the pyramid. Apparently, when this pyramid was built it started to cave in and they actually put in beams to hold the walls apart. Later on as the building began to fail, the architects changed the angle of the pyramid to finish it up with less material and more quickly. 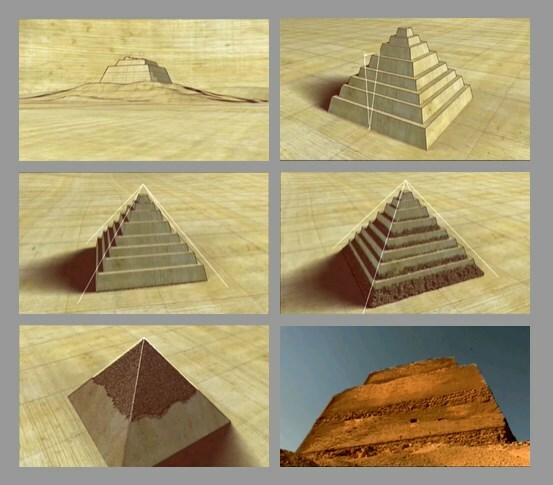 It’s thought that these are the reasons why this pyramid was abandoned. 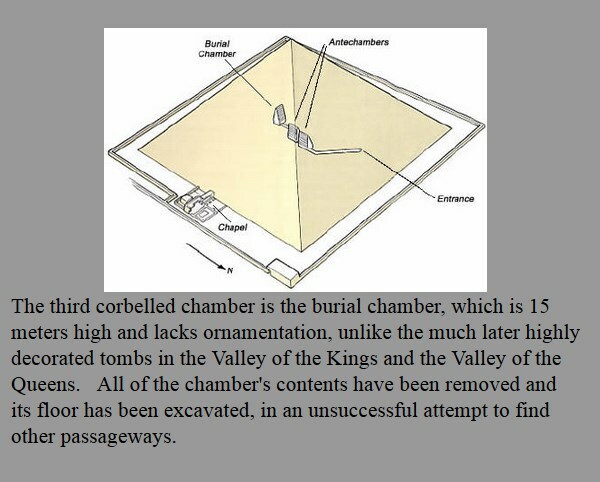 The red pyramid is probably the most successful of them, although we don’t know if it was ever used, mainly because it was the only pyramid that was built at a 45° angle and it also had chambers in the interior that were actually effective and what the right way. The red pyramid is probably the prototype for the next set of pyramids that were going to look at. The three pyramids that are the most famous and sit on the very edge of the city of Cairo are probably the least technologically advanced monuments will be studying this semester. It doesn’t take great technology to build the pyramids, they didn’t probably use great machines, although they did have and cranes, the building itself is not a technological marvel. The three pyramids sit in the middle of a large cemetery that is filled with hundreds of tombs of other minor officials. All three were built just around the same time. Within about 200 years or so. 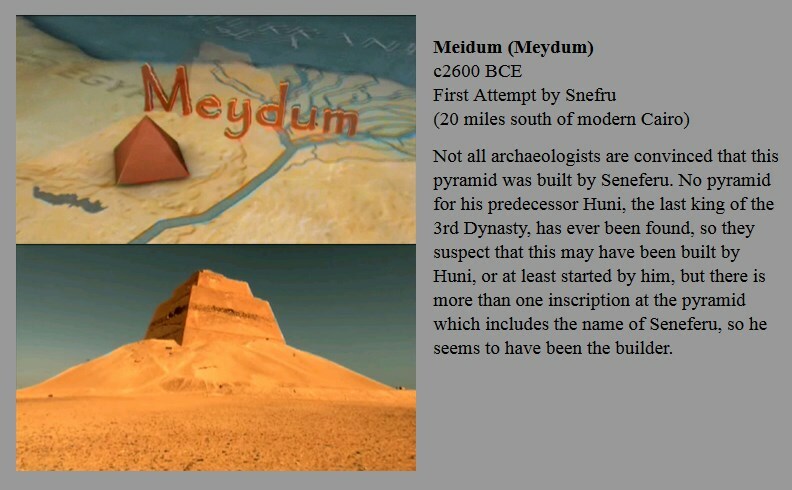 The thing that made these pyramids possible to build were the innovations of King Snefru. 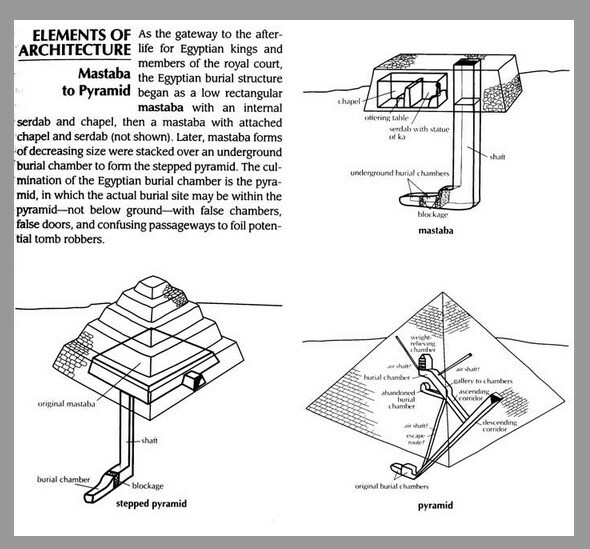 All of them incorporate relieving chambers and try to install the tomb with in the center of the pyramids. The greatest pyramid as well as all the others had long ago been looted by treasure hunters. By the time Napoleon came upon the pyramids a hole had been busted in the side of the largest pyramid that is now called the great gallery. They found no painting inside the tomb except for graffiti. Archaeologists have found no loot or treasure inside the tomb. There almost completely without ornament. In fact, the limestone sheets that are almost like icing on the top of the pyramids is all that’s left of the original casing that they had on them to make them look smooth. 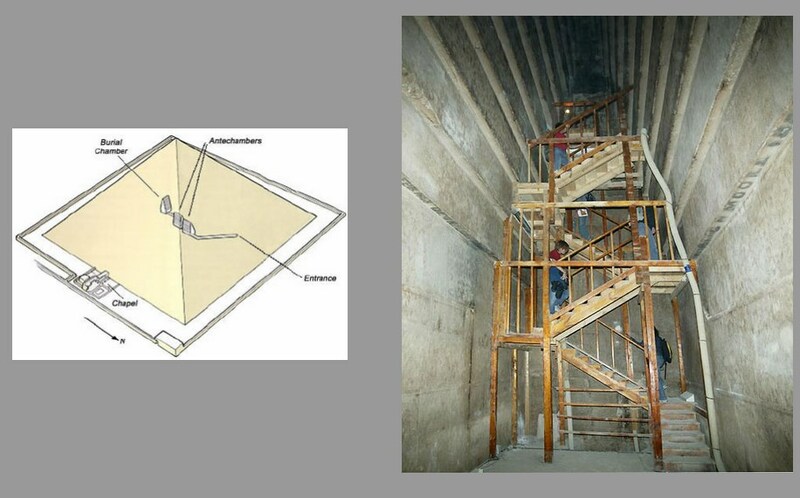 There is some interesting data about the relieving chambers of the great pyramid. There are several relieving chambers above the main one and apparently there’s some evidence of cracking when they were building the pyramid and concern that the interior chamber would fail. However it did not and they continued on and completed the pyramid. The main burial chamber was constructed around the sarcophagus. Apparently the tomb itself never actually contained anyone’s body. Although the great pyramid covers almost 2 to 4 football fields worth of real estate the leveling of the base of the great pyramid was no technological marvel. 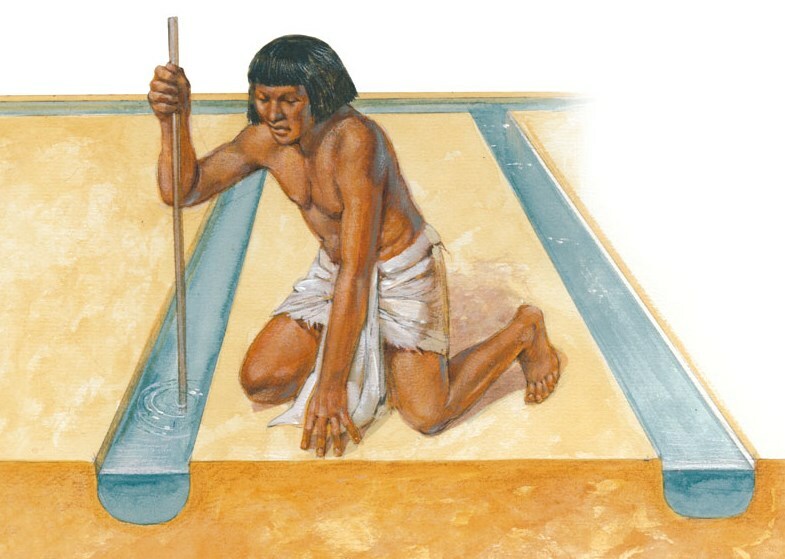 The architects dug down to the bedrock underneath the sand and then through good old hard work created level channels in which they would measure whether or not the water would run out to see if the base was level. The real marvel is how the materials got there and what kinds of machines were used to lift the blocks into space. There are quite a few television shows and books about the building of the great pyramid. The best of the lot is by Bob Brier was a professor at Long Island University. The best guesses about how the pyramids were built at first were based on the wrong information. The Bible describes that the Jews built the pyramids and that they were slaves. All of the contemporary data that we have, including some recent archaeological finds at the bases of the pyramids, indicate that an elite group of builders were employed and well fed and able to build the pyramid in a much shorter time than had been previously thought. In fact it might have been a patriotic duty to go work on the teams that built the pyramids in that several hundred year span. The data that supports this supposition is that they found the graves of the workers and all of them were very well fed and have received excellent medical treatment. Archeologists found the remains of large dining halls in which the remains of high protein foods, such as fish bones and other kinds of animal bones, were found scattered on the floors. They also found the remains of bodies in which the workers bones showed good medical care and excellent nourishment. 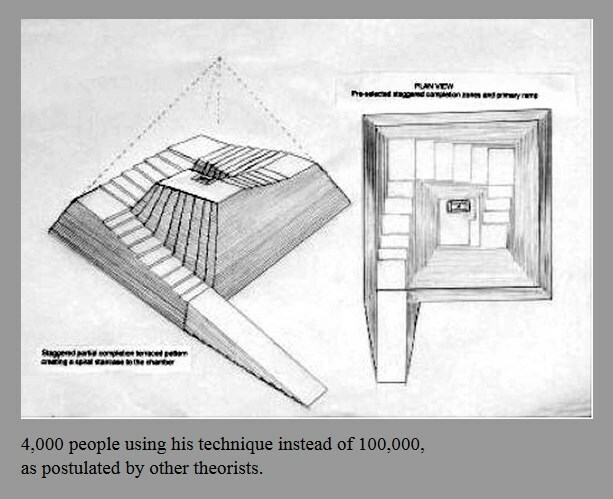 Some of the most fun ideas about how the pyramids might’ve been built are that they designed a series of concentric spiraling ramps. However, some of the designs of these ramps are two wasteful and would’ve used too much material and art the possibility. 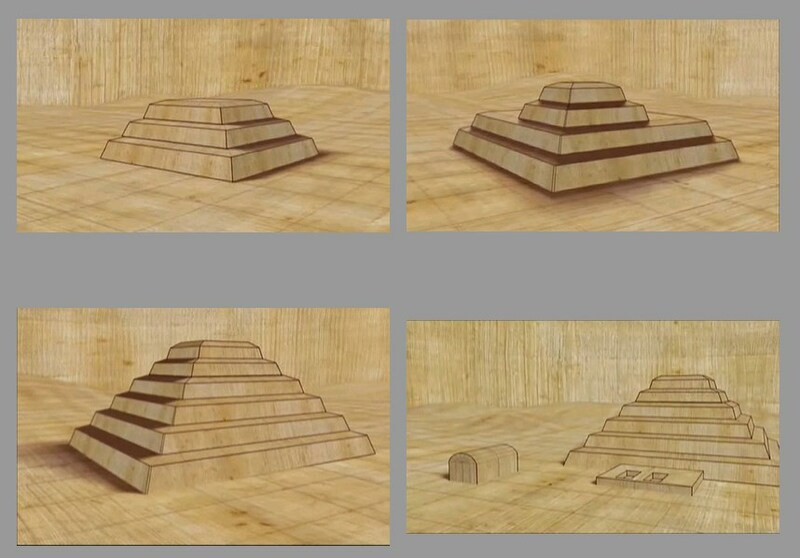 One theory, promoted by Bob Brier, suggests that there were set of internal ramps that sort of shaved the corners off the pyramid as they built it up. It’s a fascinating subject and worth watching either the videos or reading up on it. Here are some diagrams that describe some of the theories.